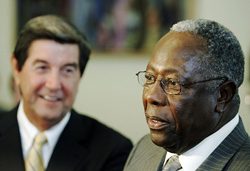 In 2007, Henry Aaron received a hero's welcome at his home state’s capitol as he was sworn into the Alabama Academy of Honor, joining prominent politicians, industrialists and luminaries from the state such as novelist Harper Lee and (then) Secretary of State Condoleezza Rice. Aaron, who grew up in segregated Mobile, Alabama, where he learned to play baseball in a pecan grove and was too poor to own a bat…compared the tribute from his home state to his greatest honors, including most valuable player trophies, a World Series title and induction into the Baseball Hall of Fame at Cooperstown, N.Y.
"I was thrilled beyond words," said Aaron after soaking up several standing ovations from the more than 200 people who crowded into the old House chamber for the ceremony. "It's good to be back in Alabama where I learned to play the game and that's been such a big part of my life," said Aaron who still serves as an executive with the Atlanta Braves. Aaron held the record as Major League Baseball's all-time home run hitter from 1974, when as an Atlanta Brave he hit homer 715 to break Babe Ruth's record, until July of 2007, when San Francisco's Barry Bonds broke Aaron's record of 755. Throughout Bonds’ pursuit of the home run record Aaron, who was often lauded for his dignity and respect as a baseball role model, said he was gratified by those descriptions. “There are so many ball players that don't accept being a role model, and we are role models," Aaron said.